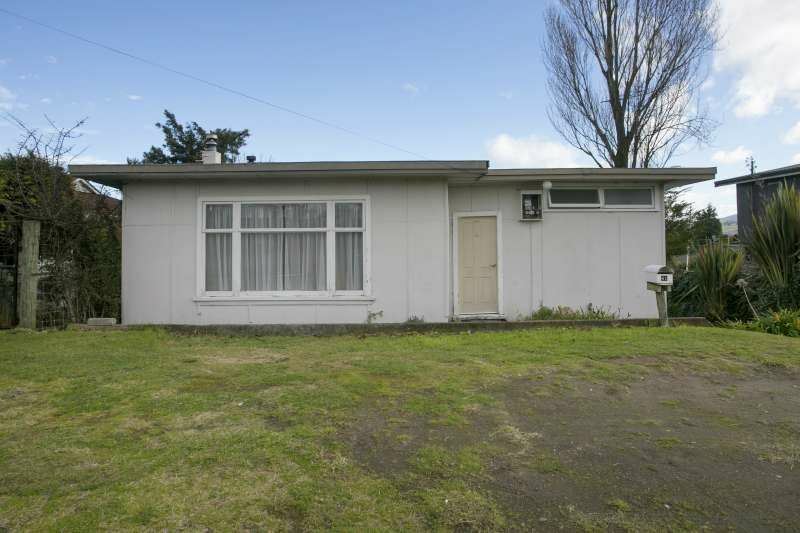 This bach in Taupo sold for $310,000. Sales were achieved on a third of the residential properties auctioned by the country's largest real estate agency last week (ending October 22). Harcourts took 141 properties from throughout the country to auction last week and achieved sales on 46 (33%) of them. The rest were mainly passed in for sale by negotiation post auction. The auction room was particularly busy at Harcourts' Taupo office, where 37 properties were auctioned. This was almost as many as for the whole of Auckland where Harcourts auctioned 39 properties last week. But the sale rate was better in Taupo, where sales were achieved on 20 properties (54%) compared to just eight sales in Auckland (26%).There was also strong auction activity in the Waikato and Christchurch. At the Taupo auctions prices ranged from $307,000 for a house at Tauhara to $805,000 for a lifestyle property at Kinloch. At the Auckland auctions prices ranged from $440,000 for a one bedroom unit at Albany, to $1.4 million for a house at Milford. You can check out the full results with the prices achieved on individual properties by going to our Residential Auction Results page. You can almost sense the panic that must be going through the RE industry right now..
Where has DGZ gone ? I am here! I am no RE agent and I don't work in the RE industry, but here are some of the Remuera DGZ listings on TradeMe in the last couple of days...enjoy! 1. A FINE LOOKING 'GEM' - 4/7 Victoria Avenue, Remuera, Auckland City. Last sold on 23‑Oct‑2013 for $1,268,000. 2014 CV $1,200,000. I suspect my neighbour Cowpat is selling his apartment. My prediction is it will go for around $1.5M. 2. Gracious family home in heart of the school zones - 38A Ranui Road. Last sold on 14‑Apr‑2011 for $1,900,000. 2014 CV $2,700,000. My prediction is it will just sit on the market for months with the overcooked asking price of $3,750,000. 3. The Elegance of 1920's Living - 4 Woodley Avenue (a former home of an Akl Mayor candidate). Last sold on 27‑Mar‑2014 for $2,305,000. 2014 CV $2,400,000. My prediction is it will not be sold as the vendor is likely to want > $3.5M. 4. Sensational Family Living - DGZ - 20 Bell Road. Has not been sold in the last 20 years. 2014 CV $2,450,000. My prediction is it will just sit on the market for months and months as the vendor is likely to ask for >$3M. 5. Options Galore in the Heart of Remuera - 145 Shore Road. Last sold on 17‑May‑2010 for $1,992,500. 2014 CV $3,200,000. My prediction is it will not be sold as the vendor is likely to ask for >$4M although it is PBN. 6. Friends, Family & Village Life - 20 Chatfield Place. Last sold on 06‑Dec‑2004 for $825,000. 2014 CV $1,800,000. My prediction is it will be sold for around 10% less than the asking price of $2,285,000. Welcome back, it seems to me you are predicting that vendors are wanting a substantial amount over and above the 2014 CVs, I believe quite a few vendors are waiting for the new CVs to come out in November and are hoping that these CVs will be substantially more and can then ask for more for their properties This is wishful thinking as the majority of buyers just do not have the ability to access this amount of funding , therefore nothing will be sold for quite some time. I think that just as CVs were largely irrelevant when prices were shooting up, they’ll be just as irrelevant when prices are crashing down. I totally agree with you though I think vendors have a different mind set. You seem a little pessimistic Double-GZ. I think some of those places will sell okay. Woodley Ave looks nice. Worth it just for the front gate! Word on the street is that there is renewed interest from Chinese buyers wanting to get before Jacinda's wall goes up. Contrary to popular opinion capital gain is not the prime motivating force for many buyers. Why would the Chinese want to buy when there is a real likelihood of a capital loss. Why would anyone buy when there is a real likelihood of a capital loss. While capital gain may not be the prime motivating factor of all buyers - I think capital loss is something that they would like to avoid. "Contrary to popular opinion capital gain is not the prime motivating force for many buyers." And by many you mean 3%. Taupo residents, among the bravest people in the world. They actually choose to live in the caldera of a super volcano! All those brave Aucklanders, they also choose to live on top of a Caldera. The only difference is the lottery of whose backyard is next. So Harcourts sales rate in Taupo was better than in Auckland last week. I think the point was that the total number was less rather than the the auction clearance percentage. Given the disparity in the market size I think it's an interesting point. Everyone assumes that the foreign buyers, particularly Chinese, are buying houses primarily for capital gain. But what if they are not? I know this sounds extraordinarily unlikely at first however many of the empty houses you see around have been bought for a purpose and that is to house their families while their children are educated in NZ. Obviously Auckland is preferred as it has the best university. It's not just university either as to prepare for a Western university it is best to go to a school here too. Thus school zones are important. Once schooling is finished in NZ then there is also the option of getting into a University in Australia or some other English speaking country. If Labour manage to make NZ a fairer and even more pleasant place then NZ will become even more desirable. Free tertiary education would be quite a draw card. High minimum wage too. These people will be looking to become NZ residents and citizens in order to partake of the rich offerings of an English speaking society. Once ensconced in the English speaking West the whole world becomes your oyster. Well that's how they see the situation regarding their kids. Hence study hard, learn the violin or piano, get a scholarship, go to NZ university then go to Cambridge University - the dream of every tiger mum. Sounds nice Zachary but I think those foreign buyers came for the capital gain. Look at Toronto Canada , with only a 15% foreign buyers tax implemented in April this year the average house price has crashed almost 400k. Toronto also has good schools and universities . New Zealand does not have 15% foreign buyers tax, it has 100% . THE CRASH IS COMING !!! Look at Vancouver - still up and rising since the tax. Toronto is still up in price for the year, It went a bit stupid for about six months which has skewed things a bit and given you a false impression. Canada is still pondering what to do after the 15% tax appeared to fail. Zachary you need to keep more up to date and stop hiding behind Year on Year data. Vancouver's high prices won't last for long, plus it's easy for them to hike up their Foreign Buyers Tax at any time. The experts are saying that Toronto is likely to rise again just like Vancouver did after it got over the shock of the new tax. I keep telling you guys it's not expectation of capital gain that is fundamentally driving this. I'd sooner look at the actual stats then then listen to so called RE experts, who will of course will want to keep the market buoyant. Thing is it doesn't matter how much tax is applied, it's China that is the one keeping a lid on things. CJ099, there are 1.4 Billion Chinese. New Zealand is a minnow. That was easy Zachary. Lets be honest, the only way a crash is coming, is a sustained rise in interest rates as a result of a global event, or central banks working in tandem to increase rates, or New Zealand suddenly wishing to devalue the currency. Homes are still being sold in Auckland, the churn has simply been removed, possibly agents are flipping fewer homes. October and indeed November sales will be comparatively weak , due to the decline in auction sales.Too much has been made of 'foreign' buyers. Yes I agree with you Cowpat. Sales will be low but prices will be high. Yes , the prices of the homes sold over the past 3 months will not impact the median/average price downwards. Hence why it takes two years to fully show a property market price correction. We're almost through the first year since the clock has been ticking on this since January this year when China enforced its capital flight restrictions. Late 2018 to early 2019 is when you'll see the full impact. Those paper millionaires will be just looking at well, highly over inflated CV values. Sorry, depending on which rankings you use University of Auckland has dropped in ranking this year. China has something like 5 university's in the top 100. The US, UK and Australia have better university's than New Zealand. And then we have the PTE's. Does that mean we only get the less capable students - those that couldn't get into a better university (my niece wants to do her Ph.D in chemistry - her preference is for Australian National University, her backup is University of Auckland primarily because ANU is ranked higher). "If Labour manage to make NZ a fairer and even more pleasant place then NZ will become even more desirable." So are you admitting that under National New Zealand wasn't a fair and pleasant place. You seem fixated on the supremacy of the English speaking world - that may change and it may become the supremacy of the Cantonese or Hindi speaking world. I believe a large portion of those who are educated in the West return to China. That may change? Your statement implies that I am correct right here and right now. We are talking about now BadRobot. You can't really operate in the modern Global world without at least some understanding of English but the more English words you know the better. This is just a fact. No need to be sorry BadRobot. A degree from Auckland Uni is still pretty desirable even if the plan is to return to China. And as you seem to have missed in my comment Auckland is a gateway to the prestigious universities. Train in English here in NZ and move on the rest of the world if you are good enough. Chinese kids who get schooled in NZ won't be returning to China. No way Jose! China want's them to return though and tries to woo them. My statement implies that it is the current dogma based on the USA being the "leader of the free world". As has been demonstrated in the past empires and dominance come and go - Roman, English etc. While English is currently " useful" - it doesn't mean that it will be in the future. Things change. When I say I sorry - I'm not apologising - I'm sorry for you. You seem not to understand the context in which it is said. You seem to miss the point about other university's in the world being MORE desirable (including some in China) and attempting to talk up University Of Auckland. While a degree is more desirable than no degree - unless it comes from NZ PTE (snigger) - a degree from the University of Auckland does not guarantee entry into a more prestigious university, any graduate is competing with graduates from many other university's in the world. The article I linked indicates that 80% of foreign educated graduates returned to China. I think your belief is based on your perception of China rather than the Chinese perception of China - i.e. a land of greater opportunities. I was really talking about Chinese kids who are schooled here and then go on to university. Anyway we will never see eye to eye as you have a very poor opinion of me and I for you. Opposite sides of the quadrant or something. I just think the evidence doesn't support your argument . Here are some figures on losses made on real estate sales. It is also very evident that most investors have left the market, thus it is dishonest and shows self interest when spruikers keep trying to talk the market up. Why would anyone buy property when the prices are going down. Soon you will be saving more per week than the average aucklander earns from sitting tight and waiting. Do nothing, save heaps. Buy at the bottom of the market , houses will be half price soon !!! You write, ".......houses will be half price soon !!!" No such luck for you (or me) I'm afraid.